How about a little summer CHA sneak peek? 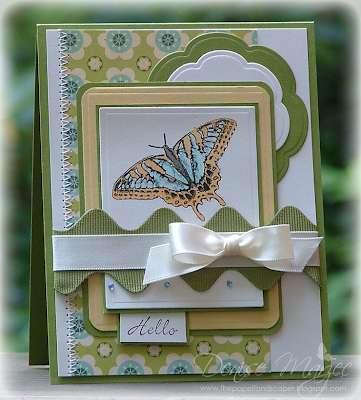 The butterfly on my card today is from a brand new OCL set called Butterfly Kisses. If you have an Archivers near you, you can get this set now. It'll be released to other stores after summer CHA (end of this month). The butterfly is colored with Copics and I added some Waterfall Stickles on the blue parts. I used the same colors on the butterfly that are in the DP in the background. 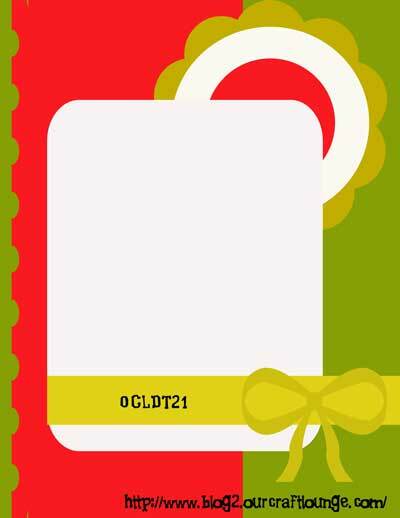 The sentiment is from OCL's Giving Thanks set. The layout is this week's OCL Friday Sketch. If you get a chance to play along, be sure to stop by the OCL blog and link up your project so we can check it out! Oh how pretty Denise! I love your butterfly and all your nestie framings - what great colors on this! I love this butterfly card. Absolutely gorgeous. The layout is awesome. This is beautiful Denise.. I LOVE the paper you chose. I could only wish for an Archivers here.. This is a fun sneak peek.. Can't wait for CHA. How GORGEOUS Denise! What a beautiful new set and I LOVE the layout and colors!! Well, you KNOW this is going to be a must have! Beautiful work! I love your take on the sketch!!! wow, this is GORGEOUS, Denise! Love the colours, love the image! Oh Denise its perfect, I adore it. Beautiful card Denise,i love the image and the colours. Wow! Your cards are amazing. I stumbled upon your blog from Christi Thorsen's blog. I will be back when I have more time to go through them! I'm tellin' ya.. seriously.. I always gasp when I see your creations. They are so crisp and clean and fresh and WONDERFUL!! Love this. TOTALLY WOW!!! Great job on the sketch Denise! This is a layered masterpiece!!! Oh My gosh, the colors and elements are pure eye candy! 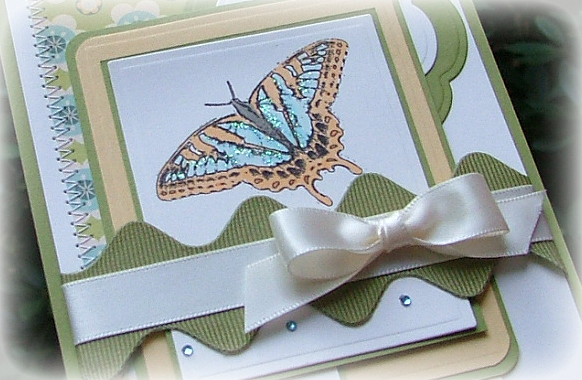 I just love the giant zig-zag, the gorgeous butterfly and DP, and I LOVE that fancy stitch you added to this card! You're amazing girl!!! This is so gorgeous, Denise!! Love your beautiful coloring! The ric rac border and the ribbon....FABulous!! beautiful job! your cards are so clean and perfect looking!! love the stitch you used here and the jewels are so pretty too! What die cut machine do you use? I love the embossing and cut together! this is so pretty! I love the color combo, the stiching, and that ric rac! Simply gorgeous! I love this soft color scheme, that giant ric rac, and the edge stitching! Counting down days! Whoa. That is one gorgeous butterfly. And and awesome job of the sketch. Just gorgeous, Denise! 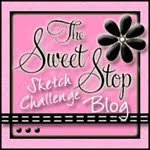 Fabulous use of the sketch, Denise! Love the DP and your colour combo is yummy. Butterflies and multiple layers - can't get any better. This card is absolutely beautiful. Thanks for sharing. Great sketch, beautiful card, and your photographs always show them off to their best advantage. Wonderful all the way around, Denise! Just beautiful girl!!! love your layers...your design...your colors..oh and did I tell you...I love it all? This is beautiful Denise!! Love your colors and choice of papers!! That layout is stunning!! Gorgeous GF! Oh my goodness! I adore this beautiful butterfly goodness! Love the sewing as well!